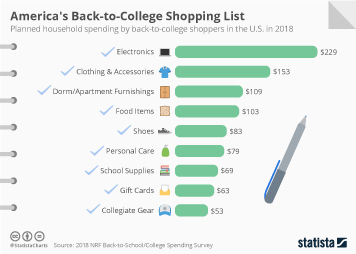 Back-to-college shopping season, generally considered together with back-to-school shopping, is a huge source of revenue for clothing, electronic, and school supply retailers. The back-to-college shopping season typically peaks between mid-July and mid-August, however in recent years, this shopping season has extended significantly with offerings and displays entering stores as early as May and lasting until October. Back-to-school and back-to-college spending is the second largest seasonal event for consumer spending in the United States. Annual planned back-to-college spending figures are surprisingly high given the stereotypically small budget of the college student. Unsurprisingly, parents play a central role by providing financial support to their college going children through the purchase of a wide range of back-to-college items. Recent data suggest that college students and their parents see this season as an investment period. In 2018, the planned back-to-college expenditure among U.S. households amounted to about 942 U.S. dollars on average. Over 60 percent of consumers planned to do their shopping in bookstores or college bookstores in 2018. Mass merchants, particularly discount department stores such as Target and Wal-Mart, traditionally have attractive promotions on back-to-college items, with the additional advantage of being a one-stop shop. Therefore some 75 percent of U.S. consumers were planning to shop in discount and value department stores. Unsurprisingly online retail also plays a role here, with over half of consumers planning to shop online where they will benefit from the ability to easily compare prices and thus hunt out the best deals. Many college students will choose this moment to invest in a new computer, laptop or other similar forms of consumer electronics. School requirements definitely play a role in this decision, with coursework and assignments often requiring to be completed online or in the form of an electronic document. Retailers are getting creative to meet the needs of back-to-college shoppers. From offering shopping lists tailored to particular colleges, to setting up pop-up booths on campuses or providing transportation from college to stores in the first week of school it is evident that retailers are aware that this is a lucrative market and they are willing to implement creative strategies in an attempt to cater to this market. Topic: Apparel market in the U.S.
Topic: Elementary schools in the U.S.
Topic: Colleges and universities in the U.S.
More interesting topics from the industry "Educational Institutions & Market"